Hi there! We really enjoyed your game! Our only wish is that it was longer or had more levels! We're hoping to see more from you in the future, so make some more games, haha! We included Sweet Wave in one of our videos. It starts at around the 2:50 mark. Enjoy! Thank you so much for playing and making a video of your experience!! Glad you enjoyed it! 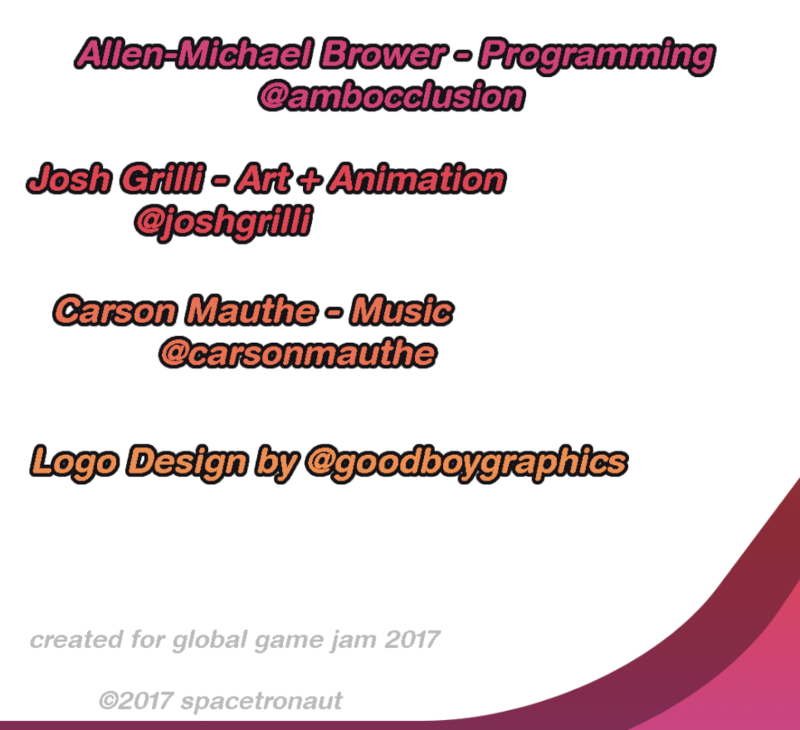 It was created in a weekend for Global Game Jam so we didn't quite have the time to make more for it, even though we also wish we did. We are still making games though so make sure to stay tuned! Thanks again!! Love that ａｅｓｔｈｅｔｉｃ. Sooo nice. I really didn't like how slow the turret turned though. I don't know if it's on purpose, but personally it felt sluggish and detracted from my enjoyment. Thanks for the feedback! Thanks so much for playing it. Sorry about the turret seeming a little slow. During game jams you don't really have a ton of time to test things so that may have just been a something we overlooked. Thanks again though! Thanks so much for playing and also recording your experience with the game! Really fun little game! 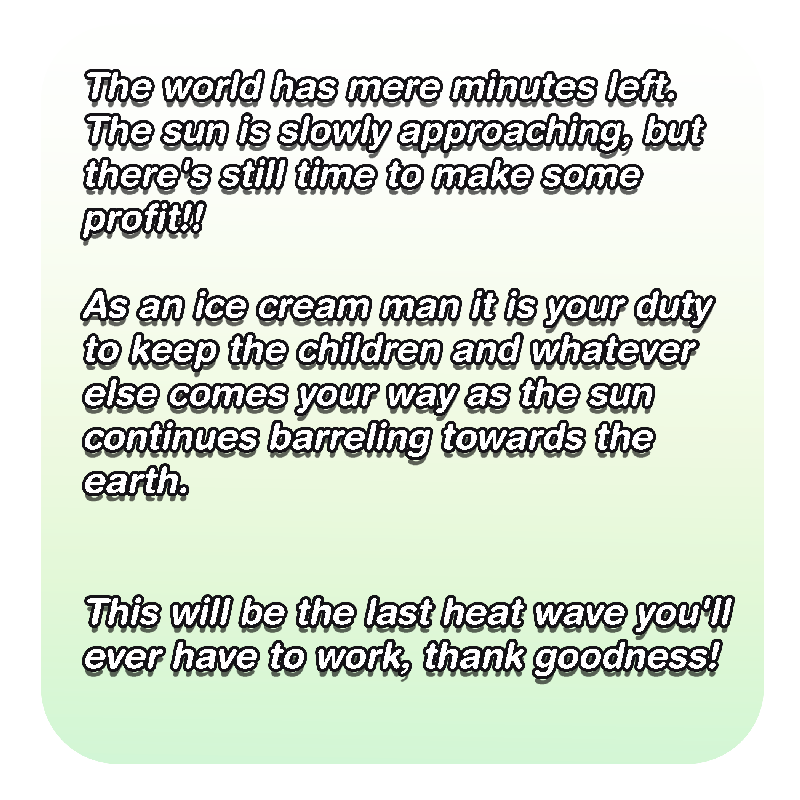 Actually made me appreciate how hard a job ice cream guys have. Especially when, you know, the sun's exploding. Awesome video! Thanks so much for sharing! Make hay while the sun shines... well, at least until it crashes into your face. Thank you very much for playing our game! Also the video is great! I liked this game a lot! The level didn't go on for too long, the controls were solid, and the music was nice. One nitpick though is that I had no idea how to activate the powerups at first and had to experiment to find out what key would use them. Other than that, it was a fun game to play! Thanks so much for playing! Yeah we just didn't even think about adding things like that, during game jams youre in a completely different headspace since you are kind of rushing on everything, if we go back to it we will be sure to add that. Thanks for sharing your experience with us also! Thanks so much! Glad you had a good time playing it, we do plan on expanding on the gameplay a little bit in the future so keep an eye out! Thanks so much for making a video! We're glad you enjoyed it! !